Springville, CA, August 26, 2010 – TEDCF Publishing, an Autodesk Authorized Publisher of multi-media courses for Autodesk Inventor, today announced the availability of Autodesk Inventor 2011: Solid Modeling, the first in a series of courses. While teaching you how to apply effective modeling techniques, author David Melvin, PE shows you sound processes that maximize your productivity and the quality of your work. Step-by-step instruction is presented in short multi-media movies that show you how to use all of the commands associated with solid modeling. This new release has a newly designed interface, which allows users to adjust the playback speed and view the lessons in full-screen. Another change is the click-able slider, making it easier to skip through or rewind each lesson. 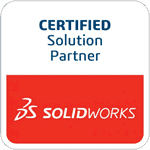 Learn more about the new Solid Modeling 2011 course.